They’re two of the most popular things we enjoy. So, which is better, cheese vs. butter? You’ve probably enjoyed both since you were a kid. And every now and then switch between them in your sandwiches. But these two dairy products, while similar in color and some uses are quite different in many ways. In this article, we take a closer look at the differences between cheese and butter. And, which one is better for you. When it comes to cheese, the choices are almost unlimited. Every region of the world has its own. And, at some point in human history, each of these regions have developed its own technique, flavors and texture. Master artisans have spent countless hours perfecting the aging process and selecting local herbs. All while simultaneously trying to perfect an ancient process. And, with a history dating back nearly 6,000 years, the development of cheese has allowed us to preserve the nutritional content in milk for long periods of time. As a result of this, we have an assortment of cheese products. They range from the soft cheeses like cottage, ricotta, cream and queso blanco, all the way to the hard cheeses. Some popular hard cheeses include cheddar, provolone. You also have cheeses that don’t really have much smell. Meanwhile, there are those that give you that strong aroma. These ‘smelly’ or ‘stinky’ cheeses include blue cheese, camembert and limburger. To understand the difference between butter and cheese, we’ll also have to explore how they’re made. This way, we get a better understanding of why they taste the way they do and why they have different textures. Cheeses are generally produced from the milk of cows, goats and sheep. To put it simply, cheese is little more than milk that has been processed with heat and fermentation. This process works in transforming lactose into lactic acid. The addition of rennet, a mammalian enzyme complex, forces a protein called casein to curdle and trap the milk fat. The curdled milk is then allowed to drain before being moved to ripen under strict environmental conditions. 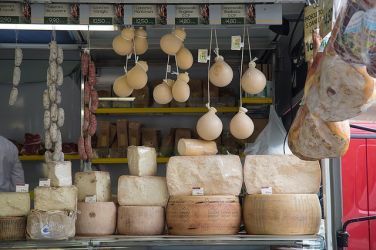 Variations in the cheese-making process, the addition of local ingredients and the type of milk used all have an effect on the nutritional makeup of cheese. 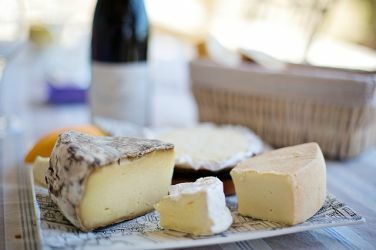 In general, however, most cheeses retain the same basic properties of the milk used, albeit in much more concentrated levels. Cheeses are high in protein, saturated fats and offer a wide range of vitamins and minerals. Cheddar, feta, Swiss and cottage cheeses are easily found in grocery stores. These common types of cheese are not only rich in protein and fat, but offer many of the B-vitamins needed to support cellular regeneration while helping the body to use available energy sources efficiently. One of the best things about cheese is that it can be eaten on its own. Or, it can be added into your sandwich, melted or used in cooking and baking. Aside from being a topping in your burger, melted cheese on pizza is among its most popular uses. Cheese aficionados meanwhile, will enjoy a platter of different cheeses with crackers. For most of us, we grew up enjoying grilled cheese sandwiches or just layering the cheese over ham in our sandwich for lunch. Much like cheese, butter was created to help preserve the nutritional elements in milk. Although, it goes through a much less time consuming method. 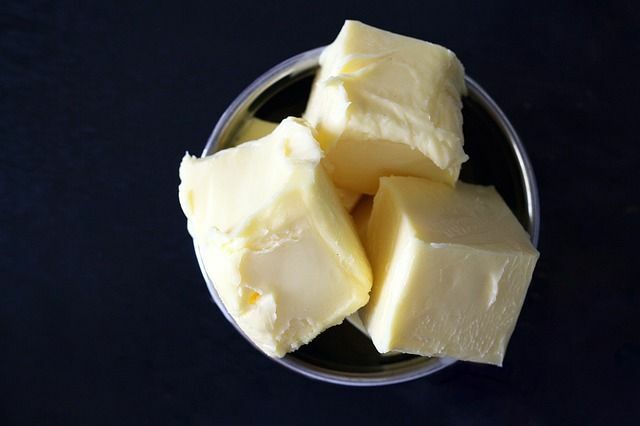 Butter has held a place in the human diet for several thousand years. But, because it tends to spoil, areas with colder climates have had more success producing it. 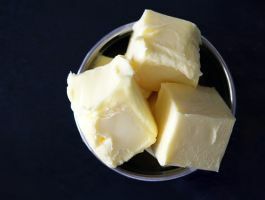 It wasn’t until the Industrial Revolution, where advances in refrigeration methods allowed for long term preservation, that butter become a worldwide dietary product. Butter in its natural form, which is the yellow stick we often see in the supermarkets, comes in fewer varieties. Over the years though, there have been more variations, though still similar, like low fat or low calorie (lite) versions of it as well as unsalted butter. However, there are still some different kinds of butter you may find. These include ghee, which is clarified butter, that’s often used in Indian cuisine. There’s also the European style butter, which has more butter fat. These contain about 85% butter fat compared to the 80% that’s found in regular butter. More recently, other new types of butter have risen. These mostly came about from health enthusiasts. Among them are organic and flavored butters. Organic butters use only organic milk. This means they come from cows that are free from antibiotics, growth hormones and pesticides. Flavored butters meanwhile, add some extra ingredient, to change their taste profile. Some popular flavorings include garlic, different types of herbs and spices, as well as chives. These types of butter you can actually make at home by melting regular butter, mixing in the ingredients and re-molding and freezing. Butter is produced by taking whole milk and extracting what is called cream. Cream is created through a natural process of separation in which the fat in un-processed milk separates from the water and rises to the top. The cream is then taken off the top, placed in a churn and continuously agitated to break the membranes surrounding the fat particles. The churning produces a mixture of water and butterfat called buttermilk. The buttermilk is then drained and the remaining fat is consolidated to form the actual butter. Butter is substantially different than cheese. Because butter is almost pure milk fat, there is very little protein found within it. However, because much of the lactose has been removed, butter is generally considered safe for those who are lactose intolerant. This isn’t the case for cheese. 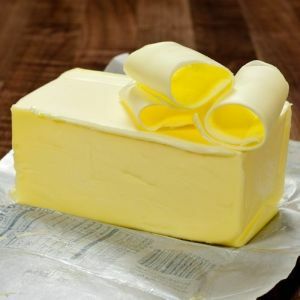 The high amounts of saturated fats found in butter have been shown to increase the likelihood of heart disease. Butter is also very rich in Vitamin A, when eaten in moderation, a good quality butter can help keep the immune system healthy. Butter it often used by spreading it over bread or toast. It is also very popular in cooking. In fact, butter is a major ingredient found in restaurant kitchens. Much more so than cheese. If you’ve ever wondered why food at restaurants taste better, even the vegetables. It’s the butter. They add loads of it. Butter and cheese come from cow’s milk. But that’s pretty much as close as they’ll ever get to one another. They’re used very differently, have very different textures as well as flavor. Both also have varying nutrient content. Though one thing is common among them, they contain a bit of fat. That’s part of the reason they taste good. Do You Need Whey Protein to Gain Muscle or Lose Weight?